The growing global population and climate change create increasing demand for a reliable and sustainable energy supply for generations to come. A simple natural phenomenon we encounter daily could become the energy source that changes the future. To meet environmental concerns, the need for a healthier living environment and to accommodate a growing population, it is vital that dependence on fossil fuels be significantly reduced. This challenge is compounded by the need to keep energy production cost-efficient. There is one resource that produces the results needed to offer a viable solution for all energy concerns: offshore wind power. In recent years, offshore wind has evolved from a secondary source of energy into a global one – with turbine capacity increasing from 30 kW to 10 MW in just 30 years, and overall project capacity from 5 MW to more than 600 MW. Simply put, it has become the most promising cornerstone of the renewable energy industry. There is good reason for this. Offshore wind is an almost CO2-free energy source that answers all climate change concerns and is absolutely inexhaustible – meaning no fuel costs, no imports necessary, and energy independence for those who act on its potential. Society as a whole benefits from the offshore wind industry beyond the energy it produces, too: It holds great potential for job creation, ultimately benefiting the wider economy. According to Wind Europe , in 2017, €7.5 billion worth of investments in Europe were committed to offshore wind energy. And while it reduces the need for fossil fuel imports, it is itself a huge opportunity for export. But to realize the full potential of offshore wind and turn it into a truly viable asset, the challenges of the future must be faced head-on. These challenges include the growing size of wind parks to accommodate them being installed farther from shore and in deeper water, so that they can access consistent and higher winds. This creates obstacles for installation, operation, and maintenance. The harsh conditions at these “at sea” sites call for reliable and robust products able to withstand environmental pressures like high wind, waves, and salt. To develop products like this without increasing costs requires innovative technical solutions. Therefore the biggest overarching challenge facing the offshore wind power industry is the reduction of energy production costs – both now and in the future. Any complex challenge requires innovation and experience to solve it effectively and definitively. This is especially true in a growing industry such as offshore wind power, where unprecedented challenges arise with this expansion. To secure a more profitable investment in the face of these challenges requires a partner with the experience and expertise to offer agile solutions. As the market leader in installing offshore wind turbines, Siemens Gamesa stands tall as the logical choice when deciding on a provider of wind power solutions. To enable profitability and reduce project risk, we push the boundaries of what’s possible. An example of this is Siemens Gamesa’s focus on digitalization, with a 3D design risk assessment able to test a product before it is manufactured, resulting in not only cost savings but also increased safety. Another is the Service Operation Vessels (SOVs), which can stay out at sea near a wind park for up to several weeks at a time. Innovations such as these are used together with proven products for assured benefit and cost reduction. With more than 12 GW of installed offshore capacity worldwide, a trailblazing and reliable product portfolio, together with global sales, service, manufacturing, and an extensive R&D network, no other company can offer as competitive a package as Siemens Gamesa. Have you ever wondered what happens when a wind power plant is installed at sea? Take the opportunity to get as close as possible to the installation of giant offshore wind turbines. Siemens Gamesa experts work together based on principles of integration, cooperation, and cohesiveness. This allows cost reduction within every phase of the value chain. The first step in a successful offshore wind power plant lies in choosing the right turbine for the specific needs. Siemens Gamesa offers wind turbines that have proven to be reliable offshore solutions since we installed the world’s first offshore turbine at Vindeby in 1991. 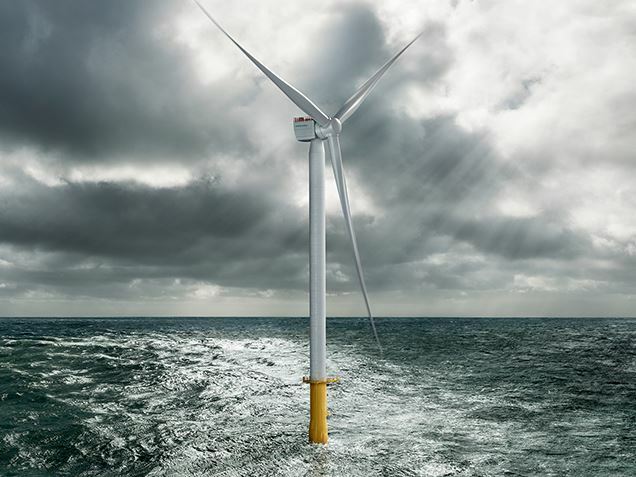 Our offshore flagship, the SG 10.0-193 DD, comes with a power of 10 MW and cutting-edge direct drive technology. With its fewer components and lighter architecture it contributes to cost-cutting goals. A comprehensive engineering value chain, with standard components and interfaces in modularization, allows for shorter time to market, while digitalization pushes the limits of performance and flexibility. Throughout the entire lifetime of a project, customers will need flexible service solutions to generate maximum return on investment. As Siemens Gamesa’s partner, you can choose from a wide range of intelligent and innovative service solutions. Offshore wind farms in particular can benefit from diagnostic solutions that enable remote control and operation. Without sending service teams to a site, our diagnostic experts can resolve more than 85% of incoming alarms remotely. In addition, they provide troubleshooting advice with 97% accuracy – enabling proactive planning of service outages and the bundling of tasks, resulting in fewer on-site visits without compromising on reliability. Through these steps, the potential of offshore wind for the future of sustainable energy can be fully realized. So, as you venture into the world of renewable energy, we can provide you with expertise and customized solutions no matter where you are in the world. Only together is it possible to get real long-term value out of wind and transform it into one of the world’s most precious assets. The further away from shore, the more expensive the maintenance? At Butendiek, our service ships help to overcome this challenge.